Because the incumbent president of the United States regularly inundates us with boasts about how he is supposedly a clever and masterful negotiator–notwithstanding the overwhelming amount of evidence suggesting that as with other claimed skills, the incumbent president of the United States suffers massively from a severe and pronounced case of the Dunning-Kruger effect when it comes to gauging his negotiating skills–I figured that it might be useful to think back to a time when actual artists of the deal made a rather good deal that many thought was impossible to pull off. 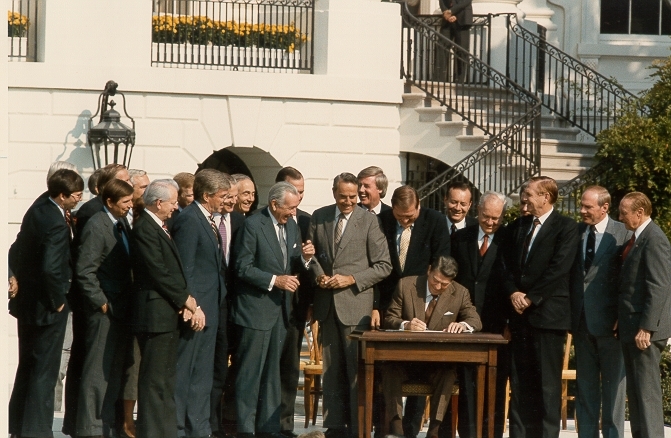 That time was during the presidency of Ronald Reagan and the deal in question was the Tax Reform Act of 1986. A good, solid, comprehensive, far-reaching tax reform bill is really difficult to pull off. It requires thousands of hours of analysis and study, endless hearings, dealing with every special interest group under the sun (placating some, buying off others, winning the loyalty of still others through effective policy proposals and straight-up defeating the rest in political combat), and because of all of the impediments presented by entrenched interests to a comprehensive tax reform package, few politicians are willing and eager to try to pull it off. But Ronald Reagan and politicians from both parties decided not to let self-interested lobbyists and seemingly insurmountable obstacles deter them from working to bring about a comprehensive tax reform package. Many a star aligned in order to make the Tax Reform Act of 1986 a reality, but part of the reason why the dream of tax reform was realized was because actual good dealmakers were on the case. Dealmakers like Treasury Secretary James Baker, who has forgotten more about dealmaking than Donald Trump will ever learn. Dealmakers like Bill Bradley, Richard Gephardt and Jack Kemp, members of Congress who were from opposite sides of the partisan divide, but who served as intellectual gurus and godfathers in helping shepherd tax reform from an idea to the law of the land. Dealmakers like Dan Rostenkowski, who assiduously worked to protect Democratic priorities as chairman of the House Ways and Means Committee, and Senator Bob Packwood, who left an extraordinary imprint on the law as chairman of the Senate Finance Committee. And dealmakers like Deputy Treasury Secretary Richard Darman, who knew the details of tax reform cold, and combined his vast substantive knowledge with a special and unique talent for dealmaking. To be sure, Darman was a prickly and arrogant fellow who pretended to be who he was not, and often, was too clever by half; his foibles helped ensure that George H.W. Bush would be a one-term president. But that didn’t change the fact that he knew his business and knew how to make deals; skills that turn out to be helpful and necessary when it comes to leading and governing. Well, no, actually. Everything that Republicans (wrongly) claimed was part of the process involved in passing Obamacare was present in the process involved in passing the Trump tax bill; there were a tiny handful of hearings, the minority party got shut out of negotiations completely, and the bill was rushed through the House and the Senate because Trump set a Christmas deadline to pass the tax reform bill. There was haggling back and forth regarding details, but given the fact that Republicans were negotiating mostly amongst themselves and given that they were absolutely determined to pass something of importance in 2017 after multiple efforts to repeal Obamacare failed and after infrastructure reform didn’t even come close to getting off the ground, the passage of tax reform turned out to have been pretty much baked into the cake. And oh, what a result it was. Last minute changes to the tax bill–including handwritten changes in the margins of the legislation, neither supporters nor opponents having any idea what was going on or what was even in the bill, a complete disregard of CBO warnings regarding the $1.5 trillion increase in the deficit that would be caused over the next decade as a consequence of the tax legislation, and an additional complete disregard of the fact that ending the individual mandate that was part of Obamacare would only serve to make the insurance markets profoundly unstable and dramatically increase premiums–which serves, for all practical purposes, as a tax increase, not a tax cut. Oh, and a massive redistribution of wealth to already-rich people–something the president of the United States admitted was part and parcel of his tax program–and the fact that contrary to promises made by Trump and the Republican leaders, we are not going to be able to do our taxes on a postcard now that tax “reform” has passed, mean that this latest “reform” legislation has nothing whatsoever in common with the Tax Reform Act of 1986. [Reagan] announced his intention for comprehensive tax reform in his 1984 State of the Union message, almost a year before he submitted his proposals, so it was well thought through, and went through a lengthy odyssey in Congress, with full hearings, markups and deliberation. While Treasury Secretary Steve Mnuchin and National Economic Council Director Gary Cohn have been assiduously working on a tax bill for several months, speed seems to be a key goal for both the administration and the Republican leadership, to have one major victory before the end of the first session. This will almost certainly lead to cuts without Reagan-type tax reforms. And lo, and behold, it did. There were no bipartisan negotiations. There was no bipartisan effort to pass tax reform last year. Republicans excluded Democrats from the process, wrote the eventual bill on their own, did nothing to welcome Democratic input in the exceedingly few committee meetings held regarding the legislation, and passed the bill on an entirely party-line vote. This wasn’t deal-making, it was exclusionary politics at its worst. And given the little attention that was paid to the actual details of the legislation, you can bet that there are time bombs aplenty awaiting us once the legislation is implemented and once we learn what is actually in the tax bill that got rushed through so quickly so that Donald Trump could claim some kind of victory and success in 2017. So, I miss dealmakers. I miss actual, serious dealmakers who could sit down with people with whom they fundamentally disagreed on the issues of the day, and still craft an honorable compromise in writing legislation that would serve the interests of the American people. I miss dealmakers who actually knew the legislation on which they were working, who were meticulous about knowing and understanding the details that legislation contained, who made genuine efforts to write legislation in the open, with committee meetings that would involve testimony and input from actual experts. I miss dealmakers who understood that passing a bill quickly is not and never was a substitute for passing an actual good piece of legislation. We are not likely to have such dealmakers around so long as Donald Trump is in the White House and so long as a dysfunctional, crazy, anti-intellectual Republican majority mismanages Congress. Maybe it is high time to do something about changing the current state of affairs. I hear that such an opportunity is coming up in November of this year.